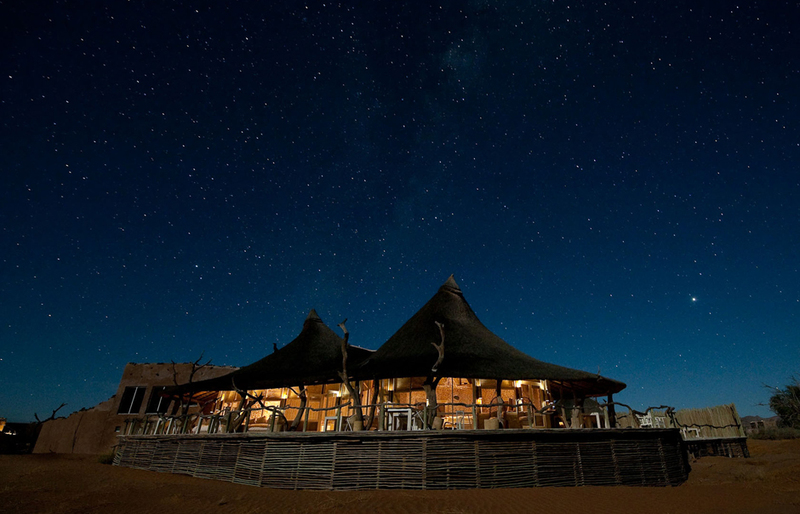 The lodge is located on a plane adjacent to the rusty sand dunes of Sossusvlei. The lodge is not close enough to overlook them though and this seems to be deliberate—as if not to risk overwhelming the cottages by the sight of the desert at its most dramatic. However, the architect Andy Chase did draw inspiration from the surrounding scenery. 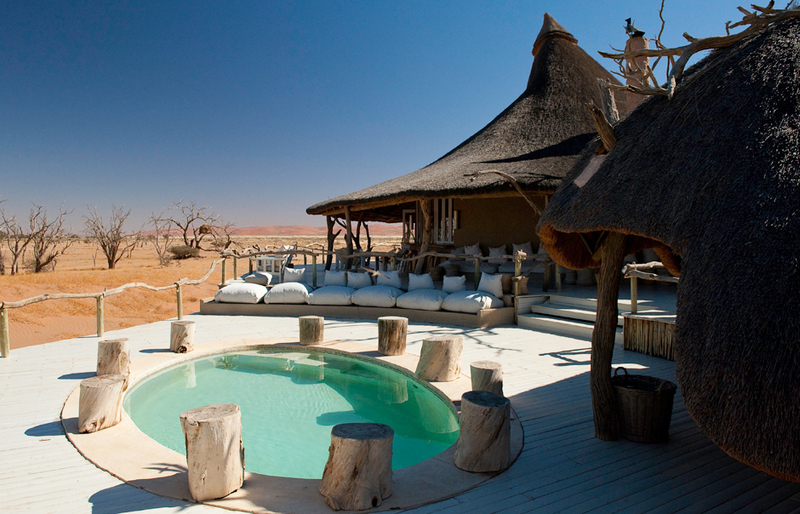 The Little Kulala lodge is well placed for an easy access to the world-famous Sossusvlei dunes. 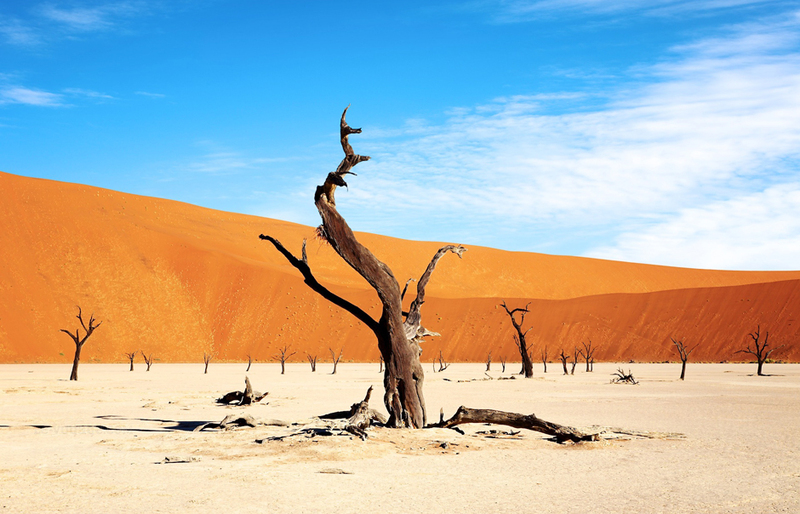 Thousands of years old, these massive dunes rise to more than three hundred metres above the plains. The most popular spot is hidden between the dunes. 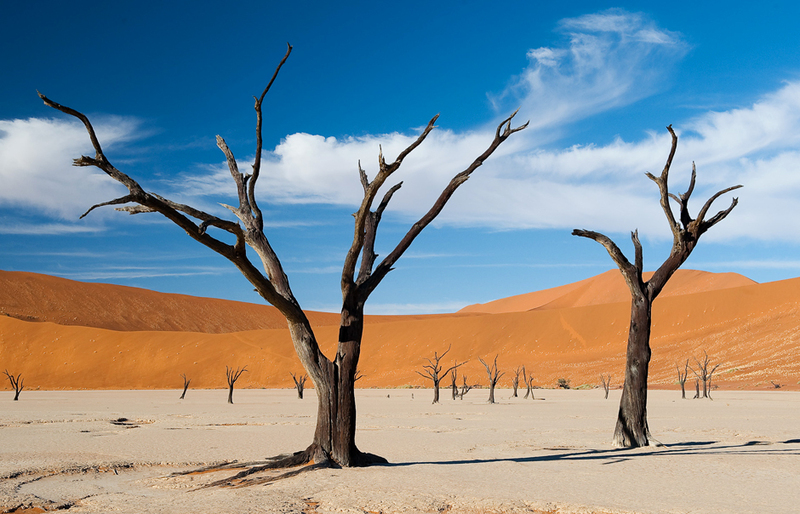 Deadvlei: a white, sun-baked pan dotted with dead, black trees. 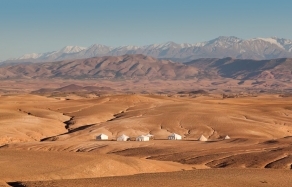 Surrounded by the rusty-red mountains of sand, the place is full of astonishing colour contrasts. An ethereally beautiful sight. 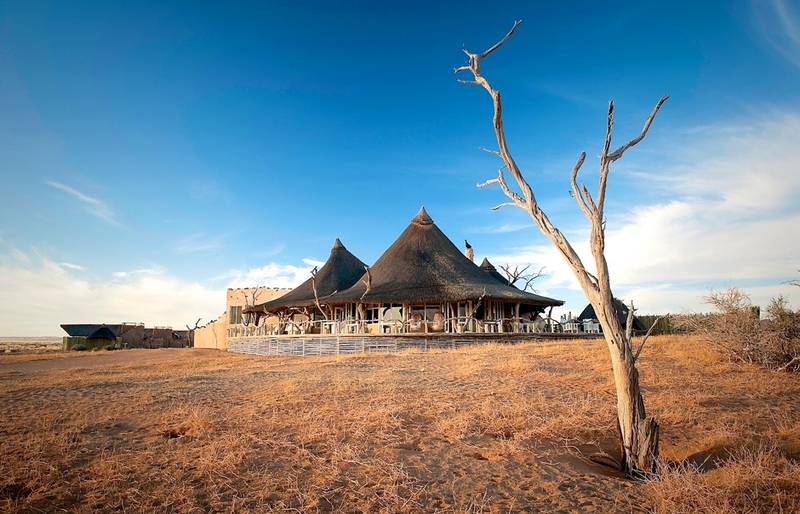 The most visually distinctive feature of the Little Kulala architecture references Deadvlei pan directly, in the full-size trees used as structural elements of the lodge, even “growing” through its thatched roofs. It makes Little Kulala feel very organic, complimenting the lodge’s location, right by a “grove” of dry trees. 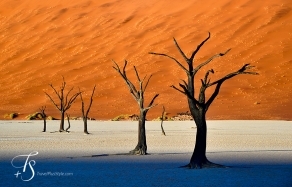 Deadvlei also provides inspiration in the palette. The lodge’s design uses bleached bone, mud and hints of silver and pale green. 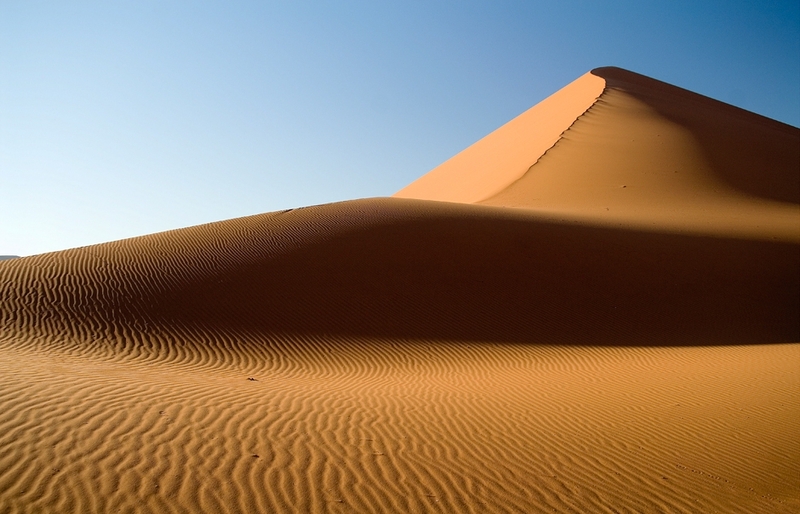 Furniture and textures draw from the tactile qualities of the surrounding desert. Materials used in the décor refer to the distinctive beauty of the outside—ever-present thanks to the glass walls, both in the lounge and guest cottages. 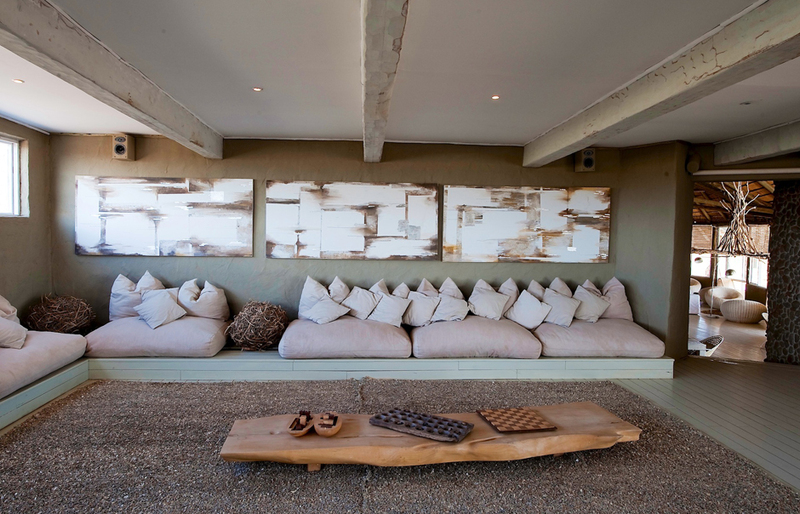 Pebble-like coffee tables, felt cloth floor cushions and curvaceous mohair-covered loungers accompany hand-dyed linens, raffia mats, rough-hewn wood, knotted leather and sandstone. We checked-in to one of the eleven modern climate-controlled cottages to find that it was as carefully designed as the rest of the lodge. It was eminently stylish, with chic wooden floors, wall-high windows, comfy rugs and seating, with bleached-by-the-sun deck and a private plunge pool. But the cottage’s most exquisite fixture was the rooftop platform, which one evening was turned for us into an under-the-stars “bedroom”. The night-sky sights, at least to us, the city-dwellers, were too awe-inspiring not to stay awake, counting the falling stars and whispering to each other long into the night. 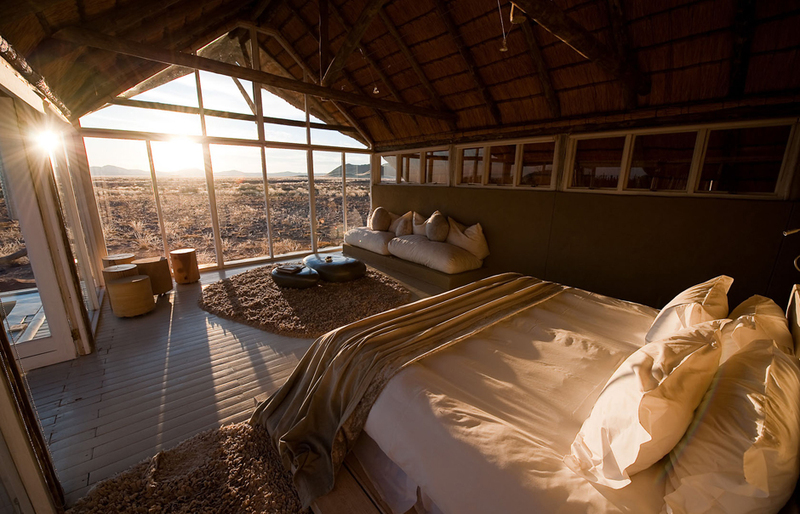 We could be excused if we succumbed to sleep immediately: days at Little Kulala can be busy. 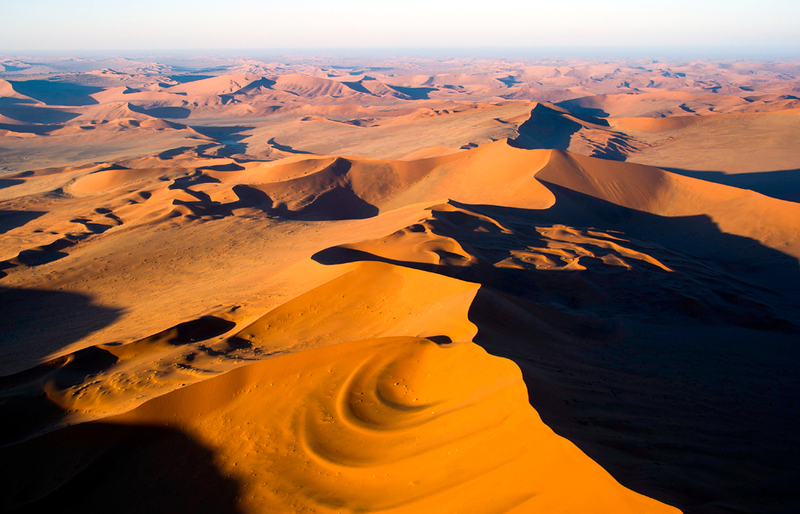 Other that drives to the dunes, of which the morning one sets off well before sunrise, the lodge can organise balloon flights, and take guests for game drives, nature walks or sunset drives… In motion from dawn to dusk—but this is how we like our travelling to be. 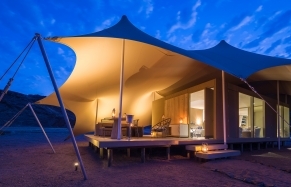 Little Kulala is a dreamlike place, where contemporary design is woven into fabric of the Namibian desert landscape. Luxurious, organic, tranquil and remote… this is a place in a league of its own—well deserving the Travel+Style Editor’s Pick badge. “Skybed” on the roof of the villa. 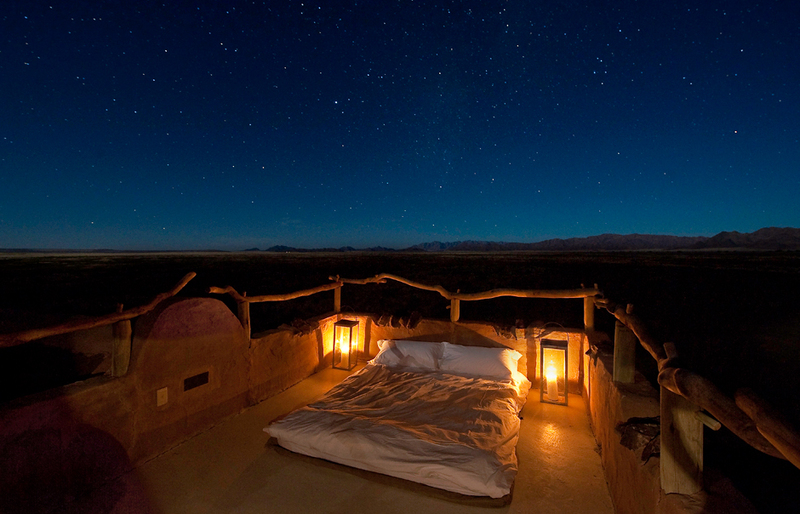 Sleeping under the stars is just magical! Drives are in closed-up Land Rovers. Limits the views somewhat but proves to be a good thing when leaving the camp before sunrise. Nights on the desert can be very cold! Children are welcome, but the environment isn't very child-friendly, and this beautifully designed lodge is dotted with easily breakable designy things!